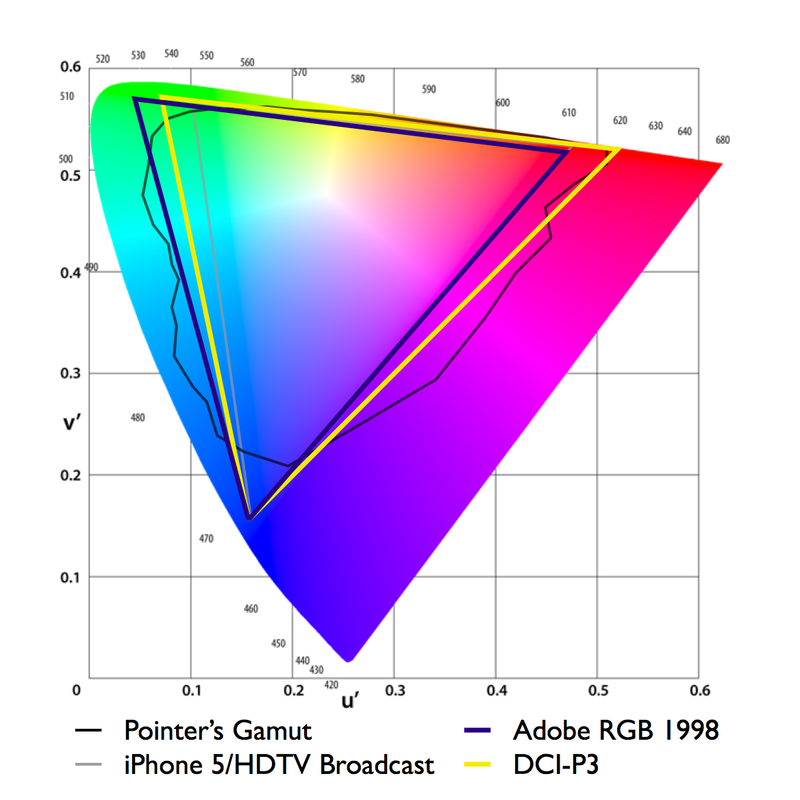 This entry was posted in Color gamut standards, Display Industry Trends and tagged Adobe RGB, broadcast standard, CIE 1976, Color gamut, color performance, DCI-P3, display technology, ecommerce, entertainment industry, LCD, rec. 709, rec.2020 by Jeff Yurek. Bookmark the permalink. This is an interesting idea which, based on the owner of this blog, I’m guessing is achievable with quantum dot film. Since full Rec. 2020 color space coverage will probably require laser projectors and/or OLEDs, this is a decent interim step. Personally, I’d prefer the green point to be a bit further out. 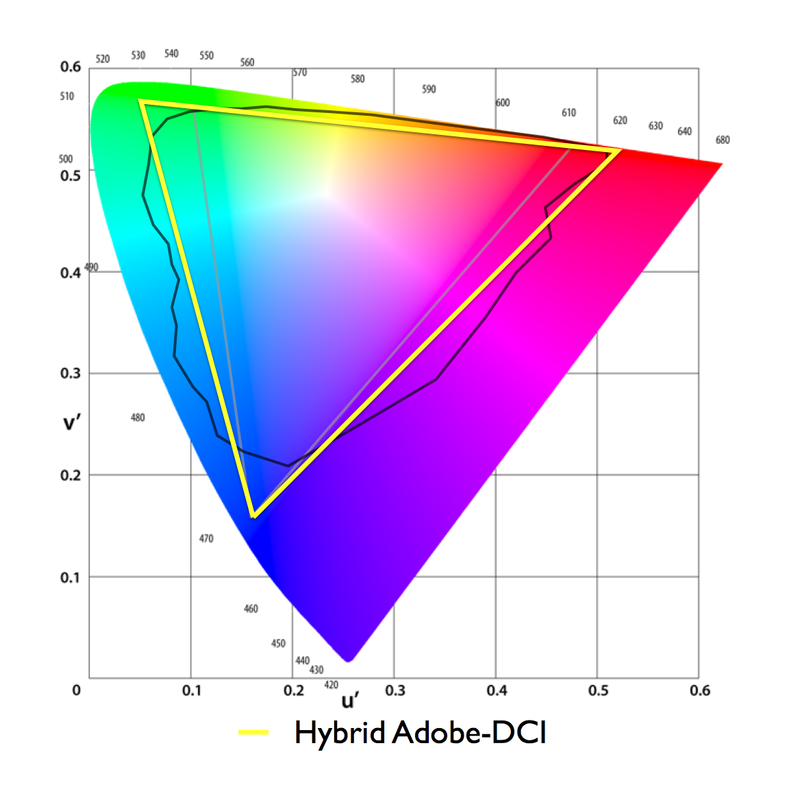 When using the green point of AdobeRGB, your Hybrid Adobe-DCI color gamut will have 100% coverage of AdobeRGB but only ~99% of DCI-P3. By moving the green point out a bit, we could have 100% coverage of AdobeRGB and 100% coverage of DCI-P3 making the monitor perfect for all kinds of content creation. Interesting article. Covering the entire Pointer’s gamut becomes a lot easier by the way when using a color system with more than three primary colors. Sharp already has HD-TVs with RYGB primaries on the market for a couple of years (Sharp Aquos Quattron models) and showed a 60.5″ TV with RYGCB on SID 2009 with over 99% coverage of the Pointer’s gamut (http://sharp-world.com/corporate/news/090529.html). There are also multiple papers around discussing displays with 6 primaries. Displays with perfectly monochromatic primaries should be just around the corner too. At least with red and blue/violet. Even some conventional TFT LCD’s with B+RG LED, GB-R LED or RGB LED backlighting already have nearly monochromatic red and blue primaries. The Samsung SyncMaster S27A850D S-PLS display for instance, with a red primary very close to 610 nm and blue also quite close to 462 nm. And there have already been OLED-like prototype displays based on lasers, resulting in monochromatic primaries. Combining those two would make it possible to display nearly every visible color, even the purely additive colors, that can only be produced by a light source and cannot be reflected off any surface. If you optimize for coverage of the entire CIE 1931 xy chromaticity diagram you can reach 73.84% with 3, 86.68% with 4, 92.54% with 5 and 95.49% with 6 primaries. If you optimize for CIE 1976 u’v’ you can reach even higher coverages. One question, do you have the Pointer’s gamut as raw data in CIE 1931 xy or CIE 1976 u’v’ coordinates in Excel, Matlab, CSV or TXT format? Because I would love to have those for making plots and calculations myself. yw，I also want to have that Pointer’s gamut raw data. That would be helpful to make calculations. You can find the data at http://www.cis.rit.edu/research/mcsl2/online/PointerData.xls. That’s the same file Jeff sent me. Speaking of color gamut standards, how do you think about BT.1361 and xvYCC(IEC 61966-2-4)? The former one doesn’t seem to have products to support it, while there are some products claiming support the latter standard. I’m using color think Pro to analyse some images as compared with the Standard gamuts (sRGB, ProPhoto, Adobe 1998). Unfortunately, Color think Pro is missing DCI-P3 profile, and therefore I can’t compare my images with respect to the DCI-P3 in the Lab or xyY colorspace, I mean in 3D. Could you please point me to any source from where I can get DCI-P3 profile (.icc) or the characterization dataset that can be used to create DCI-P3 profile? Unfortunately don’t have any .icc dataset for DCI-P3 either. I would also love to see something like this. Comparing these spaces in 3D is definitely the way to go. Please let me know if you come across something! Not sure where I got it from, but I’m guessing it’s either the Adobe Creative Suite Master Collection or the X-Rite i1Publish Pro kit. By the way, you can find your profiles in “C:\Windows\System32\spool\drivers\color” (on Windows). If you want to make your own profile it’s a bit harder, because you have to convert the CIE 1931 xy primaries to XYZ primaries (easy so far) and then do a chromatic adaption to D50 (that’s the most common profile connection space illuminant), but I’m not sure what the starting point of that chromatic adaption should be (I’m guessing the DCI-P3 white point).